Pat is from Little Rock and he brought us some nice weather on Sunday. It was just wonderful to be outdoors and actually be comfortable for a change. It has been a tough winter! They have really been yo-yoying the river levels with the current generation schedules but Pat is quite a good fly angler and he caught a number of nice fat Rainbows. It is easy to tell a good fly caster when they are punching a Winston 3 wt. rod into a twenty mile an hour wind with a nice tight loop. The flys of the day were a #16 Born’s Hairy Legged Sowbug and #15 gray flashback Sowbug. 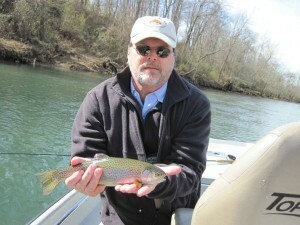 We did see just a few March Browns come off but we could not get a take on an emerger. 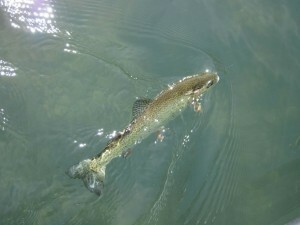 If this warm weather will just stay with us we should start to get some good dry fly action soon.